Until late March of 2016, Ontario’s Amber Alert system notified television watchers of child abductions without interrupting programming. That changed in late March 2016. CRTC approval was given to a system that interrupts TV and radio programming, forcing the consumer of TV/radio programming to miss the content they have paid to watch. 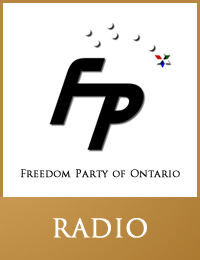 On April 28, 2016, Paul McKeever, leader, Freedom Party of Ontario, was interviewed about the changes to the Amber Alert system by Andrew Lawton, host of the Andrew Lawton Show on CFPL-AM 980, London (Ontario).